In the US and Europe, more than 40% of the adult population older than age 50 are vitamin D deficient, this being the most prominent cause of osteomalacia. http://bestpractice.bmj.com/bestpractice/monograph/517/resources/references.html – ref-4In developing countries vitamin D deficiency leading to clinical rickets is described in 60% of infants. In the Middle East, a high prevalence of rickets and osteomalacia has been described in Muslim women and their infants, perhaps due to increased clothing coverage of the skin. Ensuring adequate sunlight exposure and dietary intake of fortified foods containing vitamin D, calcium, and phosphorus may help avoid osteomalacia It is recommended that maintenance dosing in adults <50 years age should be 400-800 International Units (IU) of vitamin D daily, and that adults ≥50 years age should get 800-1000 IU of vitamin D daily. Adults should also take 1.2 g of elemental calcium in the diet or as a supplement. 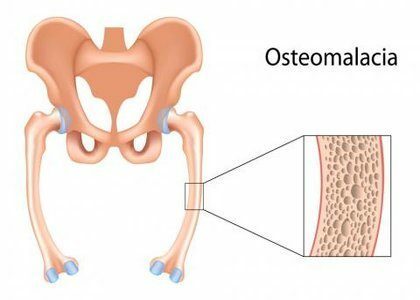 Osteomalacia in adults starts insidiously as aches and pains in the lumbar (lower back) region and thighs, spreading later to the arms and ribs. The pain is symmetrical, non-radiating and is accompanied by sensitivity in the involved bones. Proximal muscles are weak, and there is difficulty in climbing up stairs and getting up from a squatting position. Physical signs include deformities like triradiate pelvis and lordosis. The patient has a typical “waddling” gait. However, those physical signs may derive from a previous osteomalacial state, since bones do not regain their original shape after they become deformed. May present as pathological fracture. For evaluation and management of cases not responding to conventional therapy. Tanning beds and other UV-B radiation devices have been used to treat vitamin D deficiency in the elderly and in malabsorptive disorders. Early diagnosis and appropriate treatment. Counsel the patient for prevention and dietary advice. Good to see guidelines prepared by Indians for India. It would have been better to document source of the data. Available data and relevant studies from India could have been added.